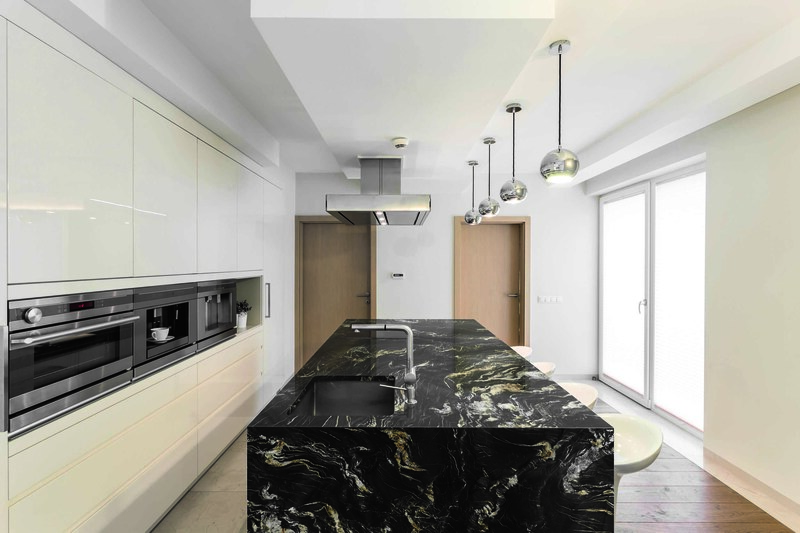 When installing marble or granite benchtops there is more to think about that may be obvious. Choosing the type, size and shape of the marble or granite that works best in the property are main considerations. But in order to make the most of your final selection, you will need to pay plenty of attention to lighting. When properly lit, your marble and granite benchtops will come alive. They are usually installed as a major feature of any room, be it a bar, hotel reception, nightclub bathroom or home kitchen. Granite and marble benchtops are not cheap, so it makes perfect sense to do everything possible to enhance them… and lighting is the best way to do that. To ensure that your benchtops are the centre of attention, you will want to avoid installing very bright or bold. Your benchtops might contain subtle hues that are greatly complemented by the right level of lighting, so you won’t want to wash those out with blanket lighting. 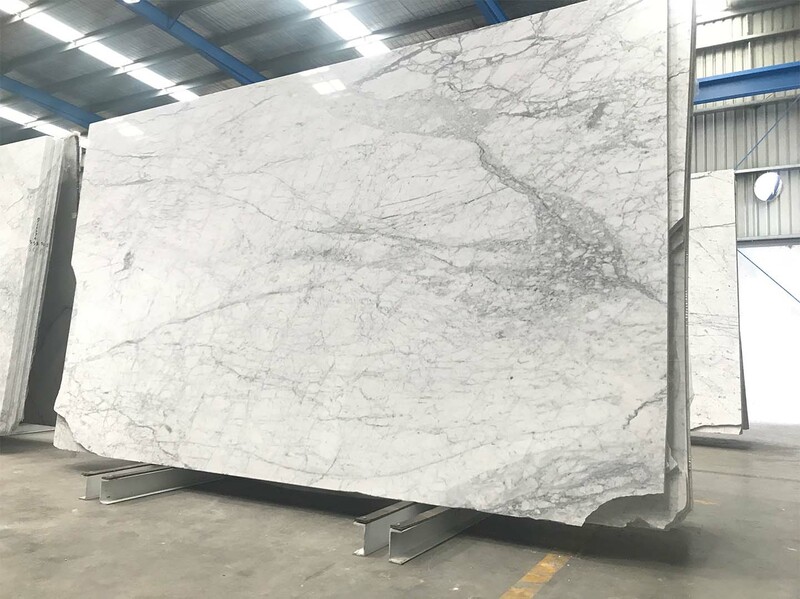 For example, if installing a white marble slab with dark grey veins like this one, you would do well to go for stainless steel or brushed nickel light fittings, which will really make it shine. You will want to try out a few different bulbs to see how varying levels of intensity and hues impact the look of your benchtop. 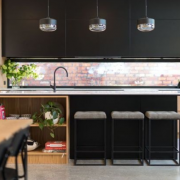 The level of brightness and intensity you choose will be dependent on details like whether the room receives a lot of natural light, what colour the walls are, whether there are cabinets shading your benchtops, and what the benchtops are actually made of. 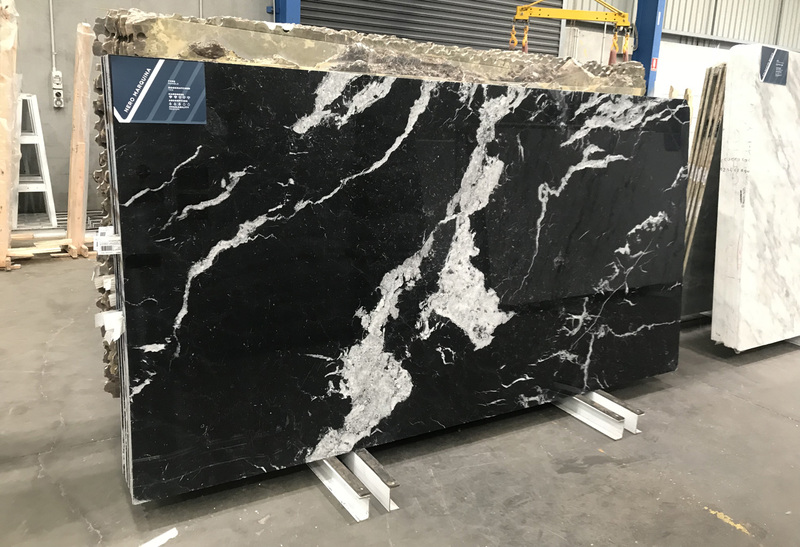 If your benchtop is made from light coloured or white material, it will benefit from brighter light; if it is made from a darker material like this Titanium Gold Polished Granite, softer light would complement it best. A dark benchtop is going to absorb more light, so install lighting that is bright enough to compensate for that. The most important factor is to avoid glare, as that will detract from the aesthetics of your benchtop. A lighting level that highlights the finer details of the material is ideal. Titanium Gold, a translucent granite at VSG. As mentioned above, cabinets can cast shadows over your marble or granite benchtops, and that will detract from their brilliance. 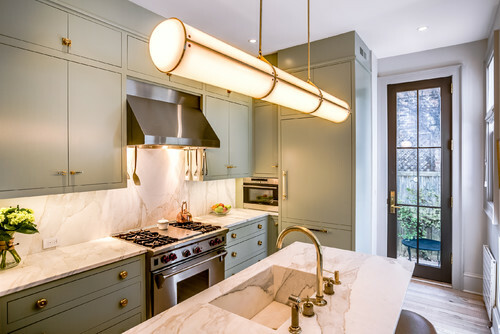 However, cabinets provide an ideal spot for placing lighting that actually illuminates the whole surface, so you can use them to your advantage. After all, there is nothing prettier than a marble benchtop with quartz crystals glinting in an ambient room. It may be advantageous to have cabinets above and around your benchtops, especially as lights on the ceiling can’t always properly illuminate them. Depending on what you’re using the benchtops for, under-cabinet lighting acts as the perfect task lighting. This is also a remedy for lack of natural light in a room. For example, if used in bathrooms, it not only highlights the benchtops; it also creates more visibility when washing your hands. In kitchens this kind of lighting helps with food prep and other kitchen activities. The proximity of under-cabinet lights to your benchtops means the hues, textures and unique details of the material you’ve used can be perfectly highlighted. The best lighting for this is pucks – circular lights installed at regular intervals, such as every 6 to 10 inches. They create pools of light on the benchtop surface, which really makes it stand out. You can also install strips if you want to distribute an even amount of light. 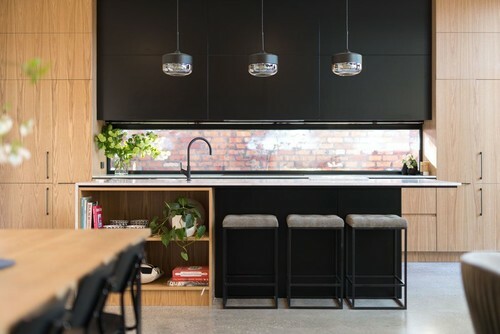 Lastly, note that the benchtop is likely to create some level of reflection, so you won’t want to install lights that shine directly onto it; opt for light fittings with a lens over the bulb, as those won’t create quite as much of a reflection. 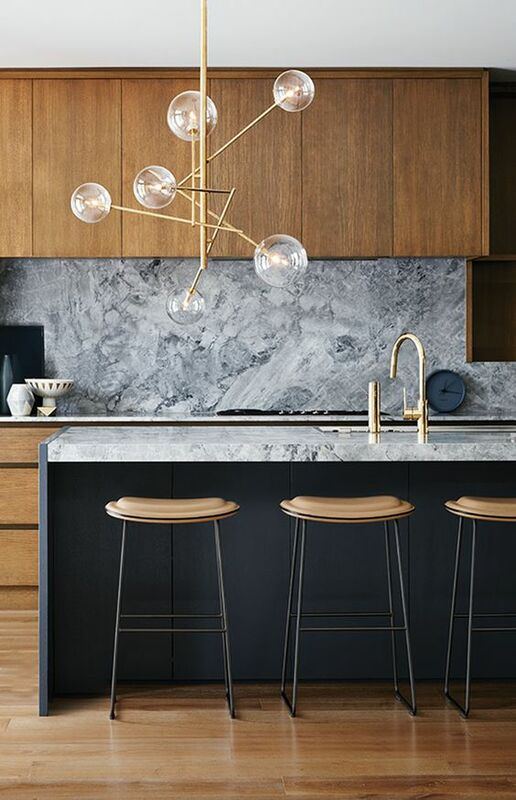 Pendant lights have long been a top choice for kitchen task lighting, and in particular, to highlight a stunning benchtop. They are certainly one of the best options, especially when you select a fitting that goes with the style of your granite or marble. 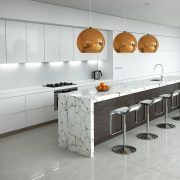 Titanium Gold benchtop with island pendants. You don’t need to choose just the one, of course. Installing a few smaller pendant lights can look even better. This works well in bars, but it can also do wonders for the look of a kitchen. When installing your light fitting, position it between 28 and 34 inches above your benchtop for best effect. There is a world of lighting options to complement your benchtop, depending on the type of material you’ve used. 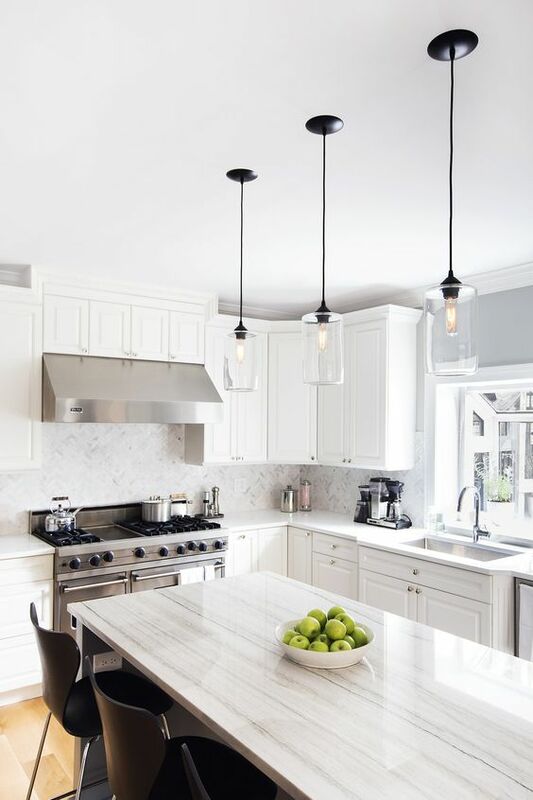 Industrial-inspired fittings look wonderful with white marble, for instance… or perhaps you will want to go for an antique-style pendant with an ambient bulb to bring out the best in a dark and mysterious granite surface. One of the best things about lighting today is that it is more versatile than ever. It is now possible to achieve all manner of wonders when it comes to lighting a room. And this is evident when you consider backlighting. A gorgeous, translucent marble benchtop with light shining through it is a sight you’ll never tire of looking at. VSG’s New York Marble backlit on display at Victorian Kitchen Company, Springvale. 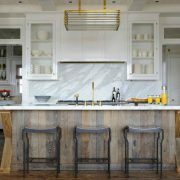 No longer is it necessary to depend on overhead lighting or wall-mounted fittings to make your benchtop shine. LED technology has stepped up to the plate and now there are many more options for lighting your benchtops in style. You will surely have heard of LED light bulbs, but have you heard LED light panels? These are cutting edge lighting technology and a very popular choice with modern bars, hotels, restaurants and more. In those places aesthetics and ambience really count. And the establishments know they can’t go wrong with backlit marble or granite benchtops. LED panels are flat light bulbs made from clear acrylic that is lit from the side using LEDs, situated in a metal frame around the outside. You can source them in different shapes, from square to rectangle. And some specialist light providers even make panels with the LEDs embedded into the acrylic. That makes it possible to customise the panel shapes. 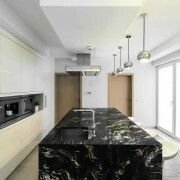 It is nothing new to backlight a translucent marble, onyx and resin benchtop. But LED light panels are now making it possible to light them in more uniform and practical ways. They can be placed flush under or against the benchtop, saving space; it also takes focus away from the lighting itself and puts it firmly on the particular assets of your benchtop. 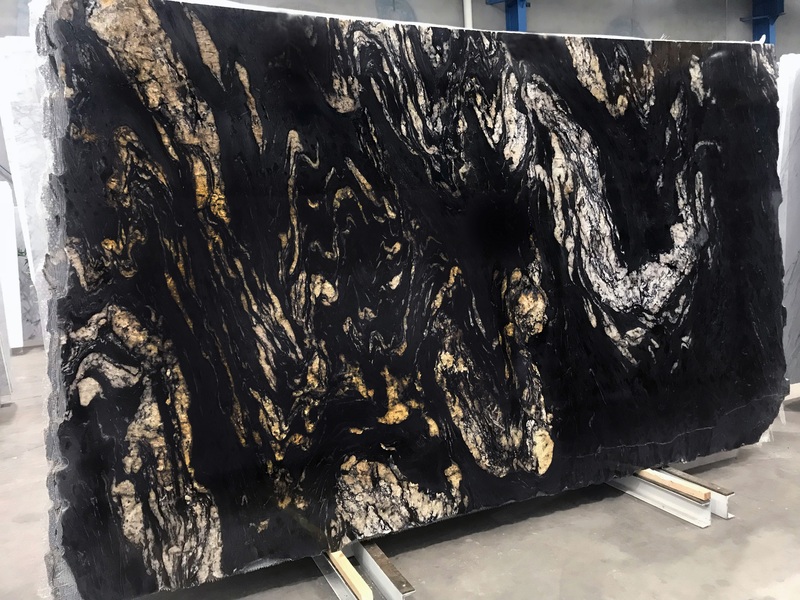 Featured in this post is Titanium Gold Granite and New York Marble, two of our favourite translucent natural stones that we have in stock here at VSG. Be sure to also check out Azul Lago Marble and Himalayan Onyx to achieve that, translucent backlit effect as seen in the New York. Don’t forget to check out the rest of our selection! In an increasingly crowded world, the minimalist interior design tries to bring a balance by reducing the amount of clutter in our homes. This trend promotes spacious rooms, with a focus on natural materials (mostly wood or stone) and clever arrangements that brings space separation without the use of walls or big pieces of furniture. Modern minimalism dances around geometric shapes, neutral colours, and natural textures that give the room warmth. When it comes to the walls and floors, the textures should be natural and (especially for the floors) easy to clean and maintain. This is why you’ll almost always find natural stone and wood in a home with a minimalist approach (think about Scandinavian design). Both materials can be used for floors and walls in a wide range of settings throughout the house or for the facades. However, natural stone is more durable and resists better to the elements and wear and tear, which is why we recommend it for most designs. Colour, texture, and lines are the primary elements of a design that wants to be simple, freeing, and welcoming. As such, these are the elements to consider when you choose the right type of natural stone. Natural stone has the advantage of colour because it features hues of black, grey, and white. These are known to promote an atmosphere of calm and serenity, which makes the material perfect for minimalist interior designs. For instance, if you decide to use predominantly white marble, this makes space feel clean and exquisite, with a note of elegance that’s difficult to obtain otherwise. Furthermore, you have the possibility to implement a monochrome palette (an all-white room), which are very popular in the Scandinavian culture. But if you choose to go with a dark colour, it will make for a fantastic background while highlighting the other nuances used (whites and greys). A black marble floor, for instance, will bring a splash of colour in a minimalist setting. And it works in any room of the house (starting with the kitchen and ending with the bathroom). The fundamental concept that represents the minimalist approach is simplicity. As such, the texture of the materials used for interior design should allow for easy cleaning and maintenance without the need for rugs, carpets, or other accessories. So, the subtle textures of natural stone will fit right in. Thinking from an interior design perspective, the smoothness of marble or the rugged beauty of travertine are fantastic for day spaces such as the living room or a home office. For bathroom and kitchen areas you can always go with the durability and freshness of granite, while for the bedroom, you can choose a warmer texture, in a darker colour, such as quartzite in brown hues. With natural stone as your go-to material, there is a plethora of lines and patterns from which to choose. As it turns out, minimalist designs are all about lines and patterns. Creating harmonious combinations that lead the eye and fill out space. Patterns can be included in any type of design element, from countertops to backsplashes, to floors and walls, or you can use them to highlight the focal piece of a room. Regardless, the unique beauty of these patterns will be forever by your side, encouraging creativity and originality! The minimalist approach is more and more popular these days, and that is due to its many benefits. Starting with a more organized space that invites to focus and productivity and ending with a house that helps you feel relaxed and balanced this trend can have a strong influence on our lives. However, it’s important to understand how minimalism works and this includes learning about the right type of natural stone to select. Each home is unique, so the choices you make must be fit to your needs and the ones of your family. 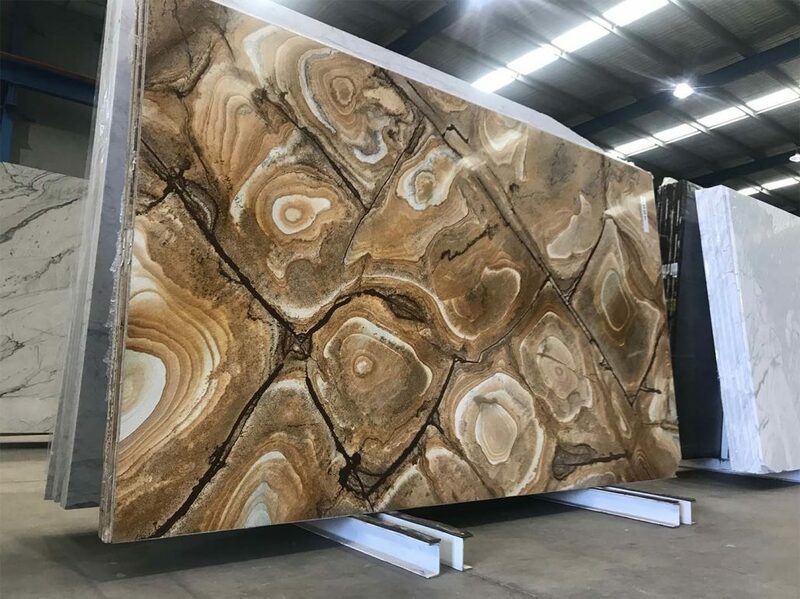 Interior Designer, Gregory Vaughn, sees the potential of a natural stone slab beyond its most common use as a kitchen benchtop, island or bathroom vanity. Gregory Vaughn is talking a natural stone feature wall. After decades of specifying natural stone, he can truly appreciate a stone slab as a work of art from Mother Nature. Challenging the common denominator of all types of natural stone in the home – its horizontal application, Gregory has called for more vertical application -in stone feature walls. We couldn’t agree more! 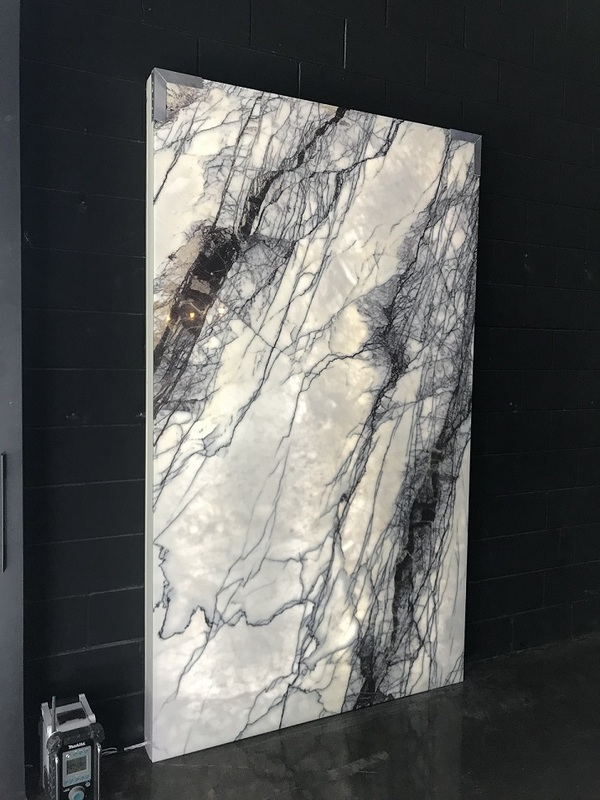 “Kitchens and bathrooms have been designed around natural stone for years but what’s really coming back into vogue now are feature walls where the stone slabs are applied vertically as an accent, sometimes being the design feature of the room. 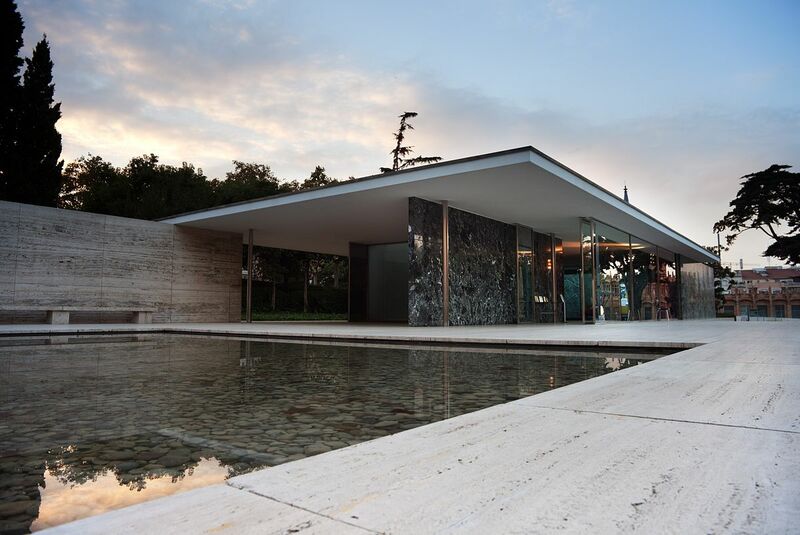 This trend is likened to Ludwig Mies van der Rohe‘s work on the iconic Barcelona Pavilion, dating back to 1929. In this article, Gregory shares his work on a client’s home to create a similar zen-like atmosphere. Finding a slab of Red Onyx too beautiful to cut up, the duo agreed on using it as a wall panel in the bathroom. 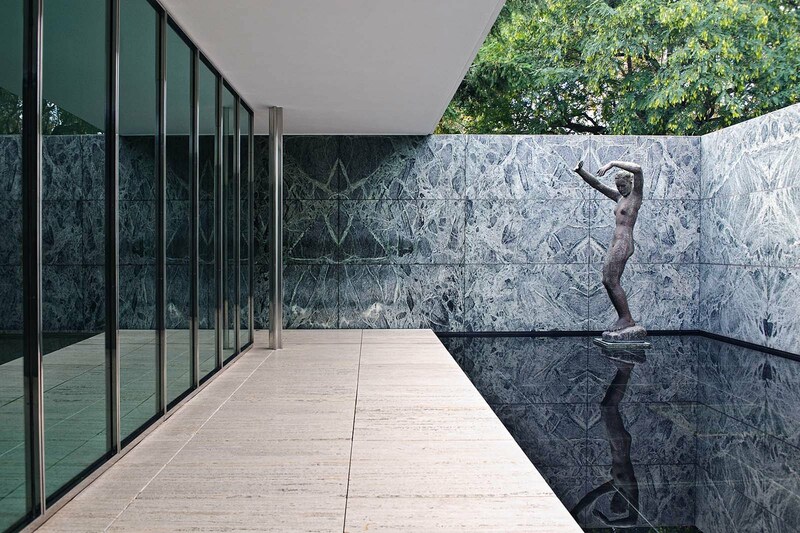 With some absolutely unique and stunning stone slabs at Victoria Stone Gallery, we would love to see the natural stone feature wall trend continue. Here’s some inspo. A coppery-gold Quartzite, characterised by its large rings in white, gold and blue tones. A bright baby-blue Quartzite with smoky-coppery gold veining. Particularly stunning in its leathered finish. 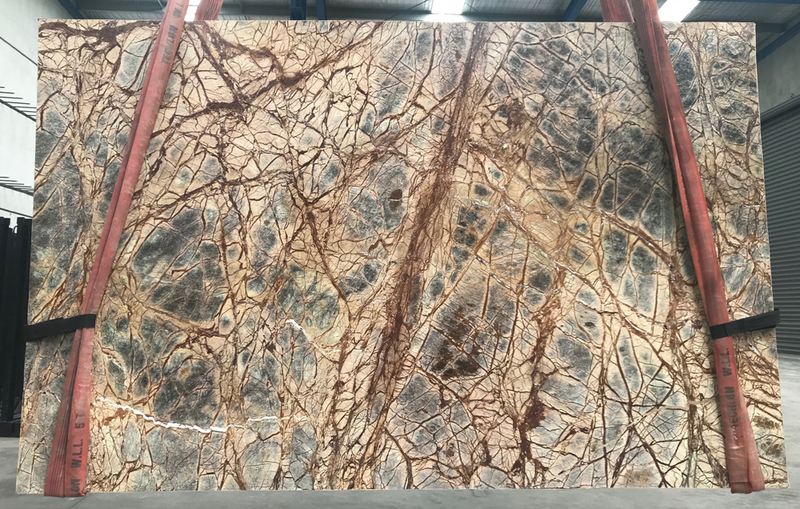 A brown and green, heavily veined marble with blue-black undertones. If you like this, check out Rainforest Green. 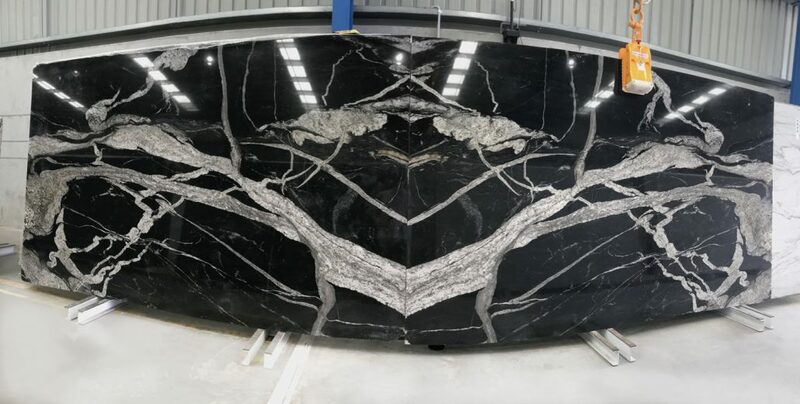 A heavily contrasted black and white granite from Brazil. Characterised by its dramatic, chunky white veining. A unique black granite, tightly packed with variously sized pebbles. 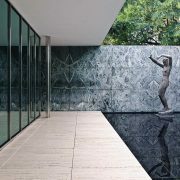 We found this article from Delgado Stone, offering advice on the best natural stone resources on the web. We think it’s pretty good, and regularly use these websites for inspiration when deciding what stones to import into Australia. If you’re looking to learn more about natural stone – look no further! Check out the list below. Anyone who has used Houzz for anything can attest how easy it is to get lost for hours (or days) on their website. One click leads to another which leads to another. It’s amazing to see some of the architecture and design work done with natural stone or any other product. Yes, there is a marketplace but if you are looking for design inspiration of any kind, Houzz should be your first stop. This is a great one-stop destination for anyone interested in the use of natural stone from around the world. A visit to usenaturalstone.com provides articles, videos, professionals, and links to countless other resources. 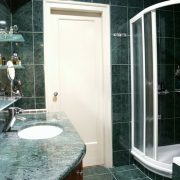 If it has to do with natural stone they either have it on their website or they have a link to help you find it. We follow this website closely to learn about news, trends, and to share with a customer when they have questions. Don’t skip over this awesome natural stone resource. You’re probably wondering why this isn’t #1. If it’s images you’re after, it’s images you’ll find on Pinterest. Here you will find quotes, images, recipes, design work… the list goes on. If you need images to inspire you go visit Pinterest… you will leave here with more inspirational images then you’ll know what to do with! We subscribe to the print edition and still follow this website closely. Most people think this website is for architects only but a quick visit tells a different story. They have something for everyone: Projects, Images, Continuing Education, News, and plenty of other information. Add the Architectural Record to your list of resources for building and design. You won’t be disappointed. These two organizations recently merged to create a “Mega Resource” for the Natural Stone Industry. 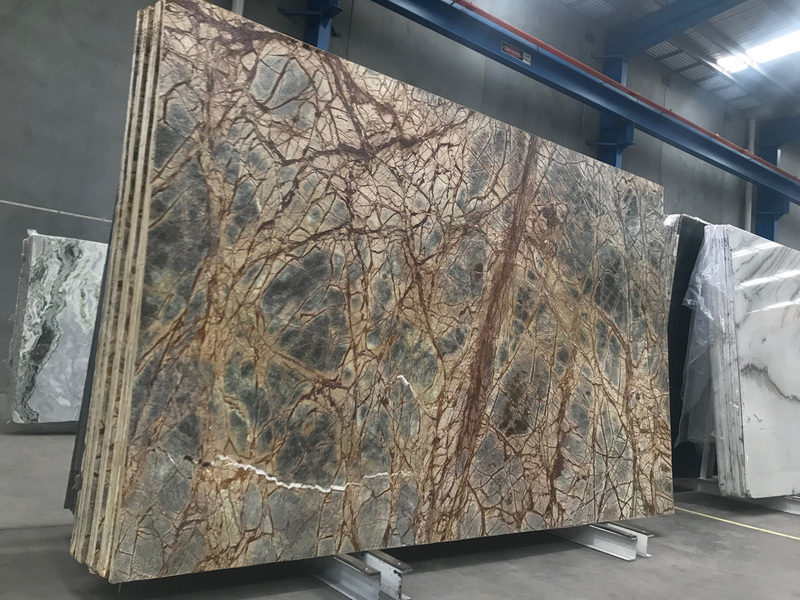 Following this organization will help anyone interested in the use of any natural stone: veneer, granite, quartzite, bluestone, marble… you get it. The Building Stone Instituteand Marble Stone Institute have joined forces and now provide one amazing resource for all of us in the building and landscape industry. When naming the best natural stone resources it’s tough to leave off Stone World Magazine. Like any magazine there are ads but if you look past that you find some excellent content and information. They continue to write great articles and feature industry experts to help generate more value to the reader. For those of you who are tech savvy, you can download their app and check it out on your phone or tablet. Renovating a kitchen calls for some big decision making. Going with natural stone will certainly add a lot of value to your home. But what stone benchtop colour schemes can you safely pick out that will be loved by many, for years to come? That will stand the test of time in the design industry? 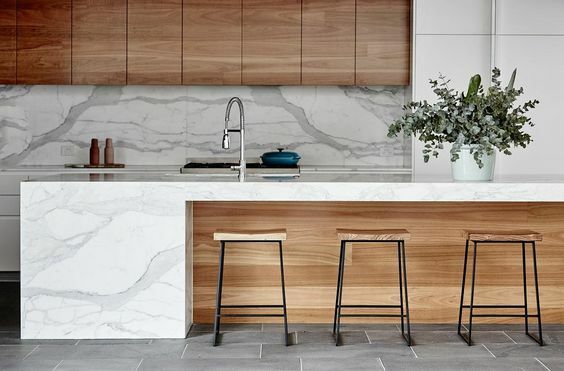 Anne Ellard from Houzz has compiled a list of the 10 That Will Stand the Test of Time and we’ve picked out a few of our favourite stone benchtop colour schemes that you can be inspired by here at Victoria Stone Gallery. There’s plenty of great advice to take from the article. How to work with colour swatches, gathering samples of textures and materials to pair benchtops with cabinet selections, and the importance of seeing the material in real life – as we say, a photo or sample will never be a true representation of a full slab! This selection of stoned benchtop colour suggestions are timeless. And if you find them a little plain, just imagine how easily they can be accessorised to seasonal home and kitchen trends! The contrast of black and white has been a much loved colour combination both in fashion and interiors for many, many years. Although the contrast of black and white is strong, it’s still a very easy scheme to live with. Because there is no real colour as such, a black and white scheme can be brightened with various coloured accessories that can easily be changed as you tire of them. When we think black and white, we think black tie – smart and sophisticated, and most definitely not out of date. To create maximum impact with this colour scheme, look for the brightest, most crisp white and the purest black. Then soften the harsh contrast of black and white by introducing some grey tones. Black is a strong tone that creates big impact, so if you have a small space, use it sparingly. Consider a glossy finish for your black surfaces; this will help to bounce light around the room and make the black feel less heavy. The purest black in the Resene colour range. Probably one of the most well-known and most popular marble choices for benchtops and sometimes floor tiles. I know what you’re thinking … boring! But white on white kitchens, although admittedly not to everyone’s taste, are perhaps the most timeless of all kitchen colour schemes and the most popular, with very good reason. White is a very easy colour to live with, it’s easy on the eye, doesn’t demand attention, you won’t get tired of looking at it and, best of all, there is an endless choice of coloured accessories that you can team with white without them clashing. An all-white kitchen exudes an air of sophistication, simplicity and grace. It looks fresh and bright and never dated. You can easily add colour to an all-white kitchen, and change it often with the use of coloured accessories such as pendant lights, small appliances and even plants. Choose your shade of white carefully. Opt for shades that are on the cooler side (with a slight blue undertone) as opposed to whites that are too warm, as these can sometimes appear yellow depending on the light in your home. One of the whitest white paints out there. It’s bright, fresh and is guaranteed to never date. 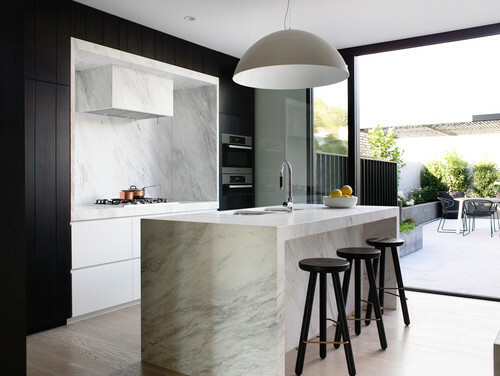 This is Caesarstone’s interpretation of natural Calacatta marble. It has a crisp, white base with an elegant grey vein. Everything about the French is sophisticated and timeless, especially their provincial kitchen style and colouring. French provincial-style kitchens tend to use subtle soft colours such as light blues, soft greys, antique whites and muted coffee colours. These soft colours highlight the detailed design of French provincial-style kitchens. 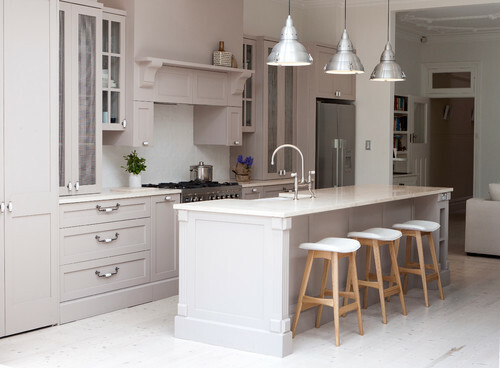 These soft subtle colours can be used to create a timeless colour scheme in both modern and traditional-style kitchens. Soft greys can have a tinge of blue, yellow and even pink to them if you would like to add a hint more colour. A beautiful natural granite (one of my favourites, I have to say) with varying tones of grey, and sometimes almost black veins, spotted with burgundy flecks on a white base. When you think olive green, army uniforms and camouflage clothing may be the first things that come to mind. However, olive green is a tasteful and sophisticated colour choice for interiors. Olive is a dark yellowish green with a soothing, earthy aesthetic. Just as the earthy taste of green olives is complemented by the refreshing acidity of champagne, the same can be said for colours that carry the same name in interior decorating. Dress olive green cabinets with warm metal handles in champagne, brass or gold colours. 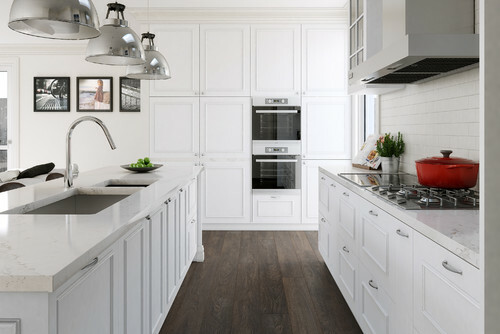 When selecting a benchtop colour, choose a light-coloured material with a creamy undertone instead of crisp white. Consider a natural stone or stone-look material that has subtle veins in darker cream or champagne to provide a refreshing contrast with the more muted aesthetic of olive green. Other greens worth considering in the kitchen are sage green and any earthy or dusty green. Think muted and murky with grey and yellow undertones. A creamy beige natural stone with hints of champagne and green. This is the perfect colour scheme for those who love black and white but want to add a little something extra. It’s a warmer alternative to the stark ‘tuxedo’ look of mixing black with white. Timber has always been a popular material choice in kitchens, whether it be on cabinetry, benchtops or flooring. Its warm colouring and natural aesthetic is appealing and inviting in any space. Almost any timber colour will work with black, just avoid anything too dark or too red as it will jar with the black. 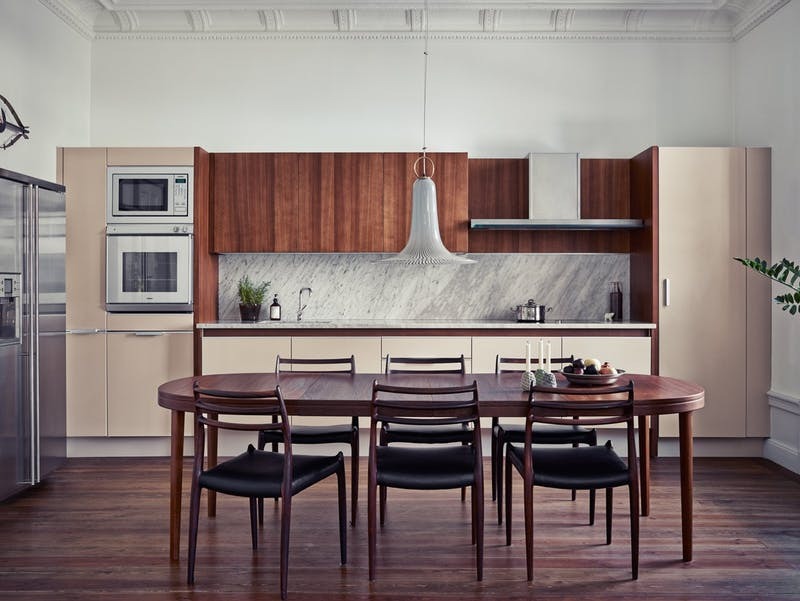 Look at timber veneer and laminate options when choosing timber colour materials for cabinetry fronts for a more cost-effective and durable alternative to solid wood. Veneer and laminate will also offer more consistency in colouring and grain pattern for a more uniform look. A matt finish black will look more natural and work much better with timber tones than a high-gloss finish. 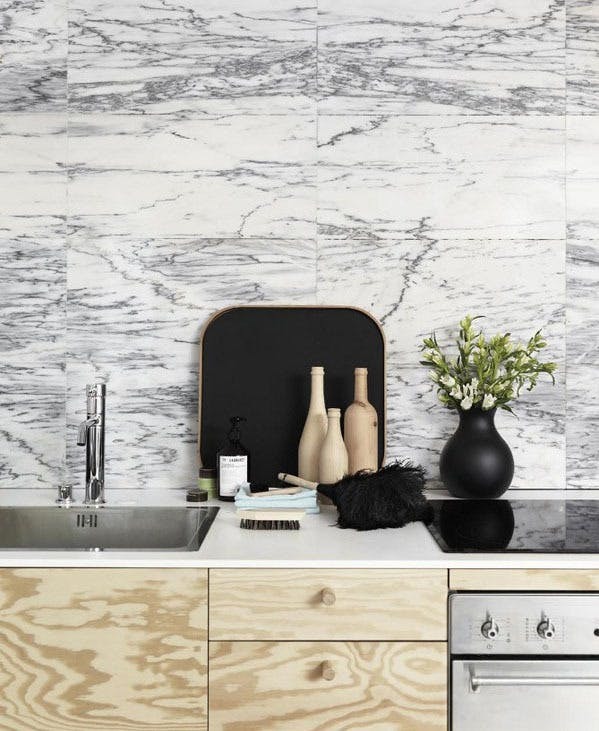 Choose a marble or marble-look benchtop that has a white or light grey base with darker grey veining to tie the look together. A manufactured material with marble-look veining with hints of gold, a perfect tie-in with the warm tones of American oak. Feeling inspired yet? Browse our Marble, Carrara, Super White, Quartzite, Granite and more for some Stone Benchtop Colour ideas! 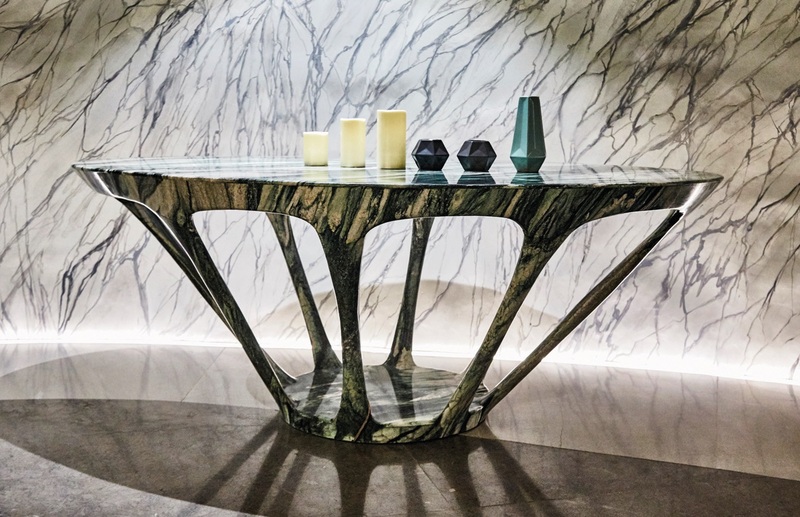 MM Galleri director, Peter Tijoe has perfect the art of curved marble. And all by near-unfortunate incident that almost cost him his business! Read how things literally shaped out for the better. Posted from thepeakmagazine.com.sg by Jasmine Tay. What’s the secret to curved marble cave walls and intricate floating tables that are unmistakably marble to the touch? Marble has been used for millennia as a building and art material. While it has been the medium of monumental works – the Parthenon, the Taj Mahal the sculptures of Michelangelo – the method of shaping it, up to today’s floor tiles and countertops, has largely remained the same. 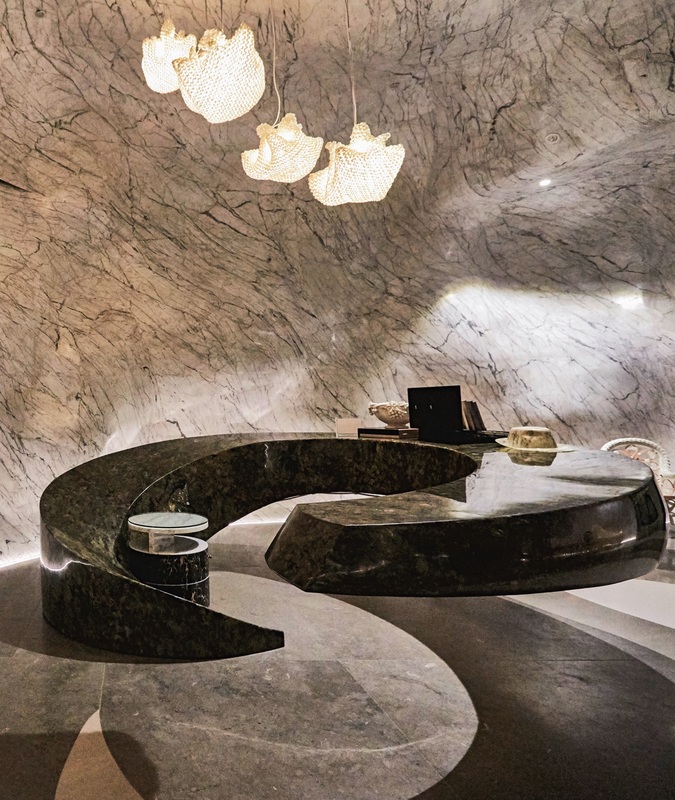 The stone is chiselled or sliced, and one wrong move could spell irreversible damage.Curved marble was certainly a costly lesson for Peter Tijoe, creative director of Indonesia-based marble purveyor MM Galleri. He almost went bankrupt after accidentally shattering a stock of marble table tops. Learning from the disaster, he would add steel plates in between thinner slabs of marble for reinforcement. Dubbed the “Floating G” by Tijoe, this table appears to be one solid piece of stone that defies the law of physics. In actuality, it is a steel frame with a heavy foot, covered entirely with slices of black granite. It was then that he discovered the stone’s limited but existent malleability. With the steel backing, the marble sheet can handle some pressure without it breaking. Tijoe then tested the limits of that bendability. The method, which he perfected last year, involves heating a 1mm marble sheet, then slowly moulding it into shape. To prevent it from cracking, he adds a chemical to the surface of the stone. Other hard stones like granite and onyx can handle this technique. Says Tijoe: “The result is a sheet we can use like wallpaper to apply on anything, in any configuration.” Such application is unprecedented. 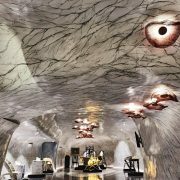 To prove a point, Tijoe created a marble cave in his Chin Bee Avenue showroom by applying sheets of white stone from wall to ceiling (header image). He also created spindly marble chairs and tables – steel structures wrapped in thin stone sheets. The use of steel frames allows designers to bypass structural limitations. “These pieces are structurally impossible if carved from marble blocks thanks to the stone’s weight. The thin legs would break,” says Tijoe. The technique has caught the attention of other designers. Last year’s Maison & Objet design fair in Paris saw Indonesian designer Jeffrey Budiman using the process to create a lamp with intricate twists of pink onyx. The technique could very well spell a new genre of design. Marble Tables Packed With Surreal Resin - Check It Out! Marble vs Quartzite - What are the differences? A Beautiful Sight, the Blue Quartzite. We love our selection of blue Quartzite stone slabs at Victoria Stone Gallery. Check out this pool house we came across. Designed by a New York architect Rafael de Cárdenas, for a mid-19th-century English country manor. Cárdenas’ approach to architecture and design “sees it apply form and materials to create spaces with distinctive atmospheres”. Blue Quartzite marble, the perfect distinctive material to use. 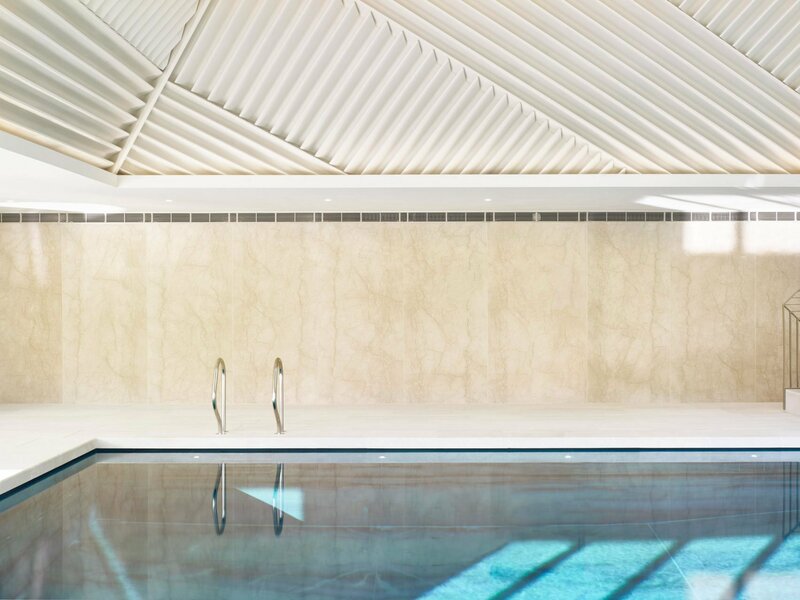 Other natural stone included in this state of the art pool house is on the walls and the floor around the pool. Botticino marble tiles makes up the floor, treated with an anti-slip rullato finish on the floors. The book-matched Azul Macauba quartzite, creating the intense blue colour of the pool really caught our eye! Quartzite is an increasingly popular choice amongst homeowners, designers and architects. Not to be confused with Quartz – the man-made material created by mixing crushed stone with colour and resin to form an engineered slab. Quartzite is formed by naturally occurring metamorphic rock. It starts out as sandstone and evolves over time under intense heat and pressure. Look out for exotic patterns of pinks, greens, reds, brown and blue quartzite that mainly come from Brazil. 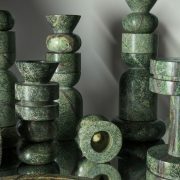 Check out our evergrowing Quartzite collection. We have plenty more arriving in the new year! 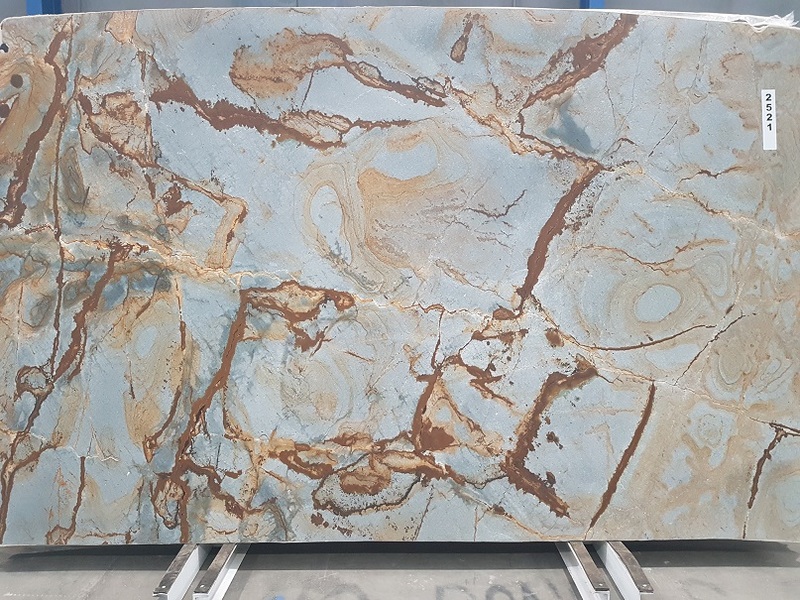 Our favourite blue quartzite is our Blue Roma. We currently have it available in a polished or leathered finish. Read about some other alternatives to marble. Watch this video of Azul Macauba being quarried in Brazil. Granite and Marble Countertop in the Kitchen. 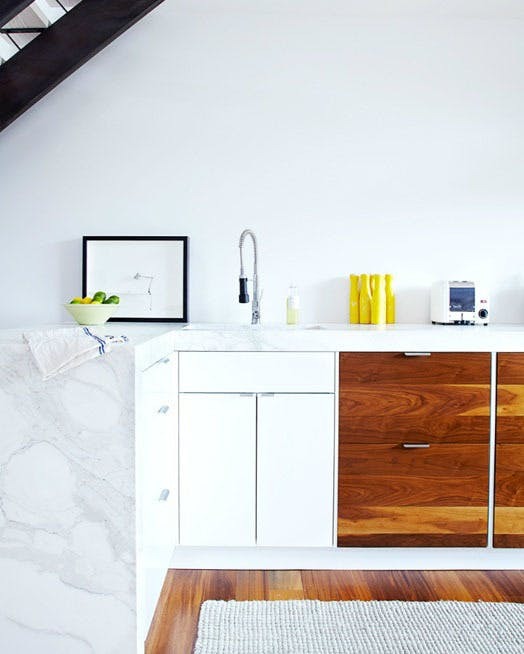 In a well-designed kitchen, prep space is key. The countertop often stands out simply because it covers so much space, especially as the kitchen becomes a primary living area, and islands become the norm. 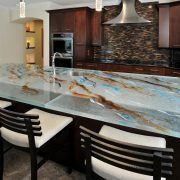 “We know the countertop and island are playing a much more prominent role in kitchen design. And now everything starts with the stone or marble countertop,”. Says Nick Harris, v.p. of marketing at Caesarstone U.S. in Northridge, CA. “Designers are working with homeowners to make sure the workspace is visually appealing. But also utilized to its fullest potential. 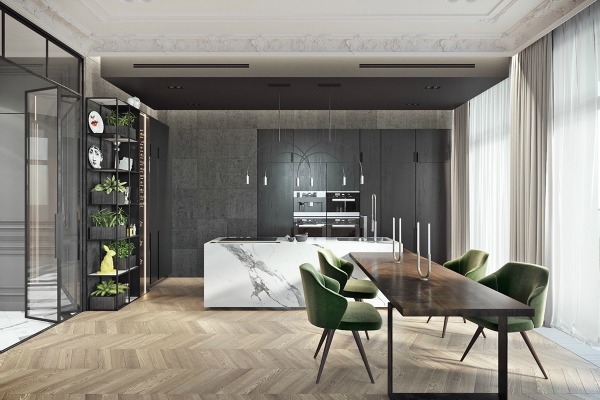 Simply put, the goal for today’s kitchen is form and function, with sleek, orderly and multi-purpose living spaces,” says Mar Esteve, director of marketing for Neolith by TheSize, headquartered in Almazora, Spain. Because surfaces are so prominent, there is great demand for variety, and the field has never been wider. Manufacturers are creating new colours, patterns and even new materials that allow homeowners to personalize their space with surfaces that perfectly suit their desired style. Aesthetically, neutral tones are on top. The look of natural materials – stone or wood – is often a top priority. Finishes are trending toward a textured, matte appearance rather than high-gloss, shiny surfaces. At the same time, designers are getting creative with mixing and matching materials to give the space a unique flair. Creative edging choices, such as waterfall edges that reach from stone or marble countertop to floor, are also on the rise. The kitchen’s large and growing expanse of countertop space has many designers and homeowners looking to blend these surfaces seamlessly into the overall design rather than drawing too much attention to themselves. 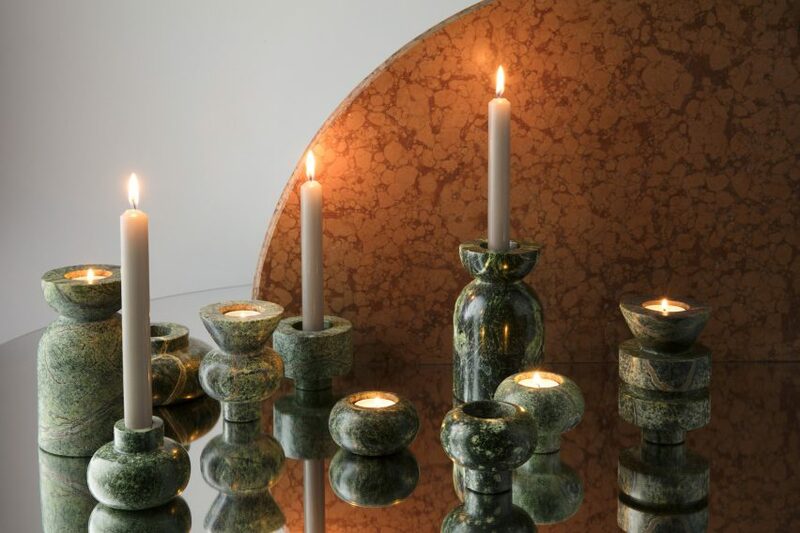 This creates a trend toward neutral tones and lends itself well to the earthy colours of natural stone or wood. 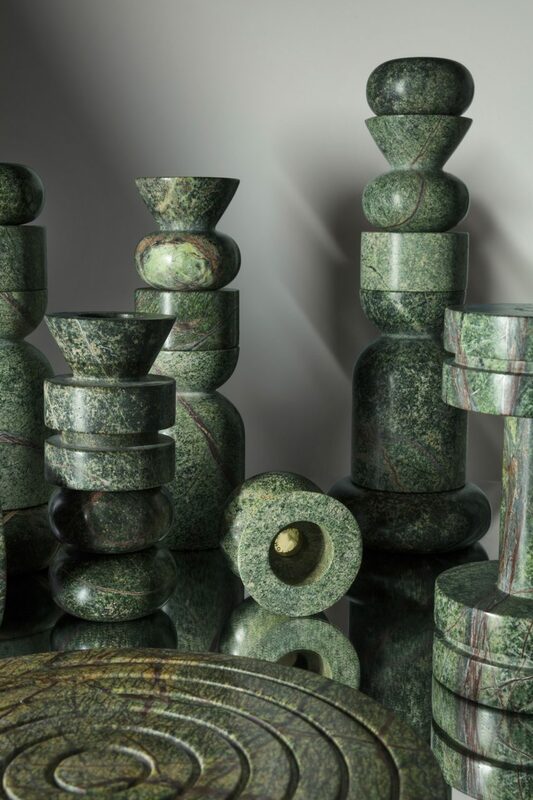 A pull toward the natural world is not only prompting designers to lean toward materials that have the appearance of natural stone or wood, but also to mimic the way that elements flow in nature. The waterfall edge on a kitchen island presents surfacing material in a clean, continuous line from the top of the counter to the floor, much like water cascading off a mountainside. “Waterfall islands are a big trend in the design industry,” says Massimo Ballucchi, marketing director at Stafford, TX-based Cosentino North America.The increase of square footage in kitchens has allowed for these spaces to include islands and additional surface space. Regardless of material choice, matte finishes and increased texture are increasingly being chosen for surface finish. “Textures are becoming more popular in both engineered and natural materials. Ranging from a matte or honed finish to a textured or leathered finish,” Congress states. This trend is consistent across a range of materials. “Texture is slowly moving from ‘look at me’ glossy on stones to matte with subtle textures for stones” adds Chmiel. 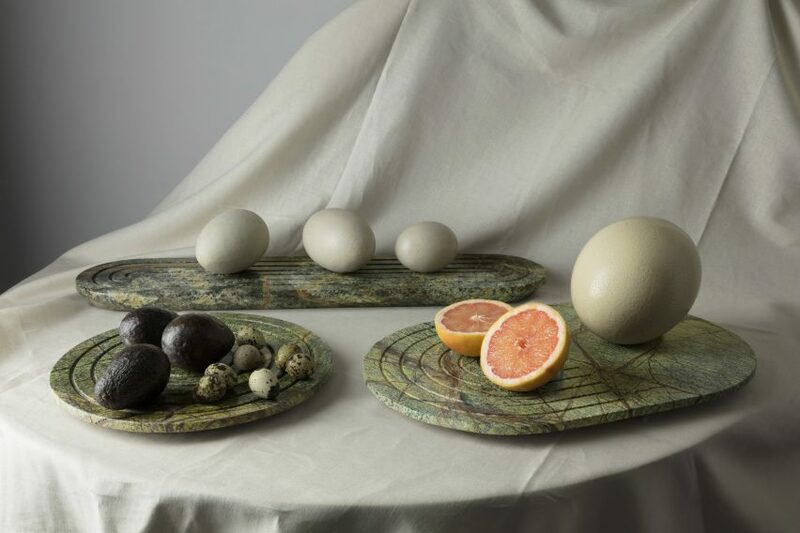 “Honed or slate looks for stone remain popular,” she adds. There are many factors to consider when choosing which material to use in a countertop. Design and colour are the first considerations, says Mays. Then homeowners are looking at durability and how easy the surface is to clean and sanitize. “When you consider all of these needs, it’s clear why quartz and laminate are the materials that are leading the market,” she states. “Quartz has that natural stone look and feel, as well as the easy cleanup and scratch and stain resistance, so it has been a big draw for homeowners. Kath sees quartz continuing to grow more and more among those who can really afford it. 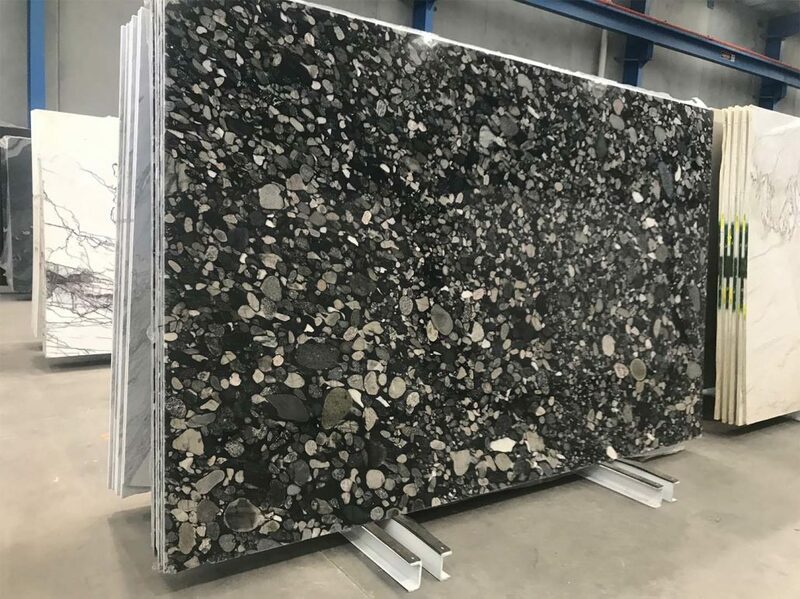 With consumers able to research and easily learn what options exist, and what’s best for their lifestyle, they tend to choose quartz because of its beautiful appearance without the worry. Read the full article at www.kitchenbathdesign.com and have a browse at our online catalogue for your new granite or marble countertop!